With the Z2000, Sanyo's proposition is clear: 1080p projectors are too expensive, and there is no need to pay the high prices. Excellent 1080p performance can be delivered for under $1900. This is a dramatic competitive move indeed. It will surely undermine the viability of the industry's 1080p price structure, to the consternation of competitors and dealers alike. But for the consumer it's great news....welcome to high performance 1080p at prices you've never seen before. Light Engine: 1920x1080, native 16:9, three-panel inorganic LCD with 165W UHP lamp. 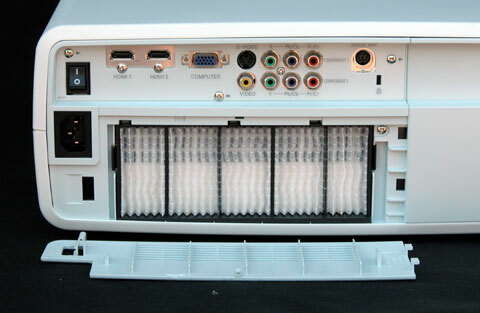 Connection Panel: Two HDMI 1.3 ports, one 15-pin VGA, two 3-RCA component input, one s-video, one composite, one 9-pin DSub serial port. Lens and Throw Distance: 2.0x manual zoom/focus lens with vertical and horizontal lens shift. Throws a 100" diagonal 16:9 image from 10 to 20 feet. Replacement lamp price: $380 retail. Street price closer to $320. Sanyo PLV-Z2000: Shown with front panel open; panel automatically slides shut to enclose the lens when not in use. The Z2000 is the most attractive home theater projector Sanyo has ever built. Its beautiful clean casework has an understated elegance that will make it a welcome addition to any living room or multipurpose family room. It is relatively small compared to many 1080p home theater models, so it can be installed unobtrusively. Its white casework will cause it to virtually disappear against a white ceiling, so it can be installed in a typical living room without calling attention to itself. If it is combined with a motorized retractable screen, the entire video system can be made to disappear when not in use. This is a huge plus for those who don't want their living room to be permanently dominated by a video system. 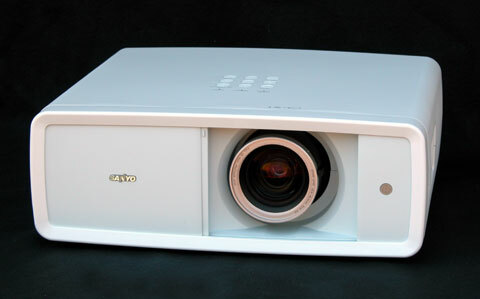 Sanyo has routinely built home theater projectors with a 2.0x zoom lens, which is about as long a zoom range as we find on this class of product. This zoom range let's you put the projector anywhere from 10 to 20 feet from the screen if you want an image size of 100" diagonal. One word of caution in planning your installation-using the telephoto end of a zoom lens reduces light output no matter which projector you use. Light output is always at its maximum with the lens in its widest angle configuration (shortest throw distance for any given screen size). In the case of the Z2000, you lose about 38% of the total lumen potential of the projector by moving the projector back and using the longest telephoto setting. That light loss is about normal for a zoom lens of 2.0x range. With the latest 1080p LCD panels in the Z2000, visible pixelation is reduced to just about nothing. Viewed up close there is a distinct pixel structure. But the inter-pixel gap is small, and the screendoor effect is subtle even at very close viewing. Once you back away to a distance of one screen width, the effect disappears entirely. There are seven pre-set calibrations for various types of dark room and ambient light viewing--Brilliant Cinema, Creative Cinema, Pure Cinema, Natural, Living, Dynamic, and Vivid. Pure Cinema is the dimmest, and Dynamic and Vivid are the brightest and also the least color balanced, being biased toward the blue and blue/green. In addition there are seven user programmable memories so you can make whatever adjustments you want, calibrating it to your taste preferences. There are five programmed color temperature options. From warmest to coldest they are Low 2, Low 1, Default, High 1 and High 2. On our test unit, Low 1 was the preferred setting for film, however, you can make whatever adjustments you want to that, or any of the programmed options. Color accuracy is one of the Z2000's strong suits. It is possible to dial in a picture averaging about 6500K with relatively uniform gray scale tracking. The Z2000 provides for a wide range of lumen potential, from the low 200's up to over 1000 ANSI lumens. For us, the most satisfying calibration for optimal video generated about 400 ANSI lumens. The Z2000 has a cool 165-watt lamp and extremely low fan noise. Thus it can be installed comfortably in a small room. The connection panel is on the rear of the unit. The projector is 13" deep, so add about 3 extra inches for cable connections, and you can install it on a shelf that is 16" deep. Fan exhaust is from the right side as you look at it from the rear, so it is important that there be plenty of clearance for heat dissipation, particularly on that side of the unit. The air filter is located below the connection panel. It is easy to unsnap the grate to access the filter for periodic cleaning, as shown in the photo above. A second issue to mention is that there is no anamorphic stretch mode with high definition signals. With HDMI or component video in 480i and 480p, the Zoom mode will give you the anamorphic stretch you need to accommodate an anamorphic lens. But when the signal is switched to 1080i or 1080p, Zoom mode becomes a different function that simply maintains normal aspect ratio--it fills the vertical space of the screen with the 2.35 image, and crops off both sides, which is of course useless for anamorphic lenses. Now, this is not relevant to you if you are going with a standard 16:9 format screen in your home. The only time you'd need this feature is if you intend to switch to a super wide Cinemascope 2.35:1 format screen and add an external anamorphic lens. This is an intensely competitive shootout as both models are formidable projectors. Price will be a big factor for many buyers. Projector prices are highly volatile and can change without notice. But as of this writing, the Z2000 is selling at a price of $2,195 after rebate, including a three-year warranty, whereas the AE2000U is selling for $2,699 with just a one-year warranty. Extended warranties on the AE2000U are available at extra cost. What do you get for the extra money spent on the AE2000U? Well, for one it has better contrast and black levels than does the Z2000. On the spec sheets, the AE2000 is rated at 16,000:1, whereas the Z2000 is 15,000:1. The difference in contrast is quite noticeable when images are shrunk down to about 60" diagonal and viewed side by side. When compared at this image size the AE2000 has a definite advantage that looks like much more than the difference you'd expect from the almost identical specs. However, once the pictures are blown up to 120" diagonal in a room with low ambient light, the difference in contrast becomes less apparent to the eye. Though the AE2000 has an advantage in contrast, the practical difference will be negligible in many home theater set-ups. In terms of image sharpness and clarity with high definition sources, the Z2000 and AE2000 are virtually identical, which is to say they are both outstanding. Both of them exceed the clarity of images we get from any other 1080p models we have been reviewing, including the JVC RS1. Perhaps the most surprising discovery in this side by side comparison was that the Z2000 actually trumps the AE2000 in its ability to deliver a smooth, filmlike image from standard definition DVD that was upscaled from Blu-ray and HD DVD players. The Z2000 showed less noise in SD source material. And while there was relatively little ghosting on the AE2000, there was none at all on the Z2000. These factors result in a remarkably smooth, clean picture on the Z2000 that was quite impressive. The AE2000 has zero pixel structure due to the SmoothScreen filter. Meanwhile, there is a subtle pixel structure visible on the Z2000 when viewed up close. However, as noted previously, it becomes invisible when viewed from the distance of one screen width. In practical terms, both images are free of pixel structure and screendoor effects from any normal viewing distance. The AE2000 has a vertical stretch mode to support the use of an anamorphic lens with high definition signals, whereas on the Z2000 this function only works with 480i and 480p inputs. The AE2000 has three HDMI ports, and the Z2000 has two. Both models are HDMI 1.3. Both have two component video ports, a VGA port, one S-video, and one composite. Neither model has a 12 volt trigger. The AE2000 has a unique split-screen calibration feature that holds half of the original image on one side of the screen, and lets you see the effects of calibration changes on the other half. This is the first home theater projector to include this particular feature. The AE2000 has 16 user programmable pre-sets, while the Z2000 has seven. Both projectors allow you to rename each of your calibrations for easy identification, rather than having to remember them by number. However, in addition, the Sanyo Z2000 also lets you rename your inputs, so instead of seeing "HDMI 1, HDMI 2, Component Video" in the menu, you can rename them to appear as, say, "HD DVD, Playstation 3, DirecTV" or whatever sources you might have hooked to those inputs. The AE2000 does not provide the ability to rename source inputs. The Sanyo Z2000 and the Panasonic AE2000U are each impressive 1080p projectors that have advantages over the other. If you are attempting to choose between them, look over the features each has to offer and select the one that best meets your needs. No matter which you choose, you will end up with a projector that you'll be extremely satisfied with. The Optoma HD80 came out this past summer at what was then an aggressive price of $2,699 for a 1080p projector. It represented an outstanding value for those who wanted to step into 1080p at a very low price. Not only was it 1080p, but it delivered an exceptionally sharp and very bright image even in comparison to more expensive 1080p models. Its shortcomings included a short 1.2x zoom lens, no lens shift, and a fixed throw angle offset that made it uniquely suitable for ceiling mount, but difficult to install on a rear shelf. It also had higher than average fan noise, and a 300-watt lamp that throws off quite a bit of heat. The replacement lamp costs $480, which is higher than average. Competition marches rapidly on-prices get lower and products get better. With the introduction of the Sanyo Z2000, the entry level price of 1080p takes a big drop to $2,195. In addition to the lower price, the Z2000 brings with it incrementally higher contrast, a slightly sharper picture, almost silent fan noise, and much greater installation flexibility due to the 2.0x zoom lens and extensive lens shift. The Z2000's lamp is only 165 watts, so the projector doesn't radiate as much heat. In terms of overall picture quality, the HD80 and Z2000 are very close. In reality, the differences are only apparent in side by side comparison. Due to the varying effects of ImageAI on the HD80 and the variable iris on the Z2000, the two projectors will alternate back and for based on the average light level of any given scene as to which looks higher in contrast, or deeper in black level. And in any case there is not a radical difference between them. On an ANSI checkerboard pattern, the Z2000 measures slightly blacker blacks, and slightly brighter whites. But when standing back and looking at them, they appear essentially identical. The Z2000 has an advantage over the HD80 in sharpness and clarity of the image. This is not to say that the HDD80 is soft--certainly it is not, and it looks great on its own. But the latest LCD panels render an incremental sharpness and clarity that becomes evident in side by side viewing. Comparing the HD80, which is a DLP projector, to the LCD-based Z2000 highlights two competitive weaknesses of DLP technology. First, manufacturers using DLP light engines have not been able to design projectors that have anywhere near the zoom lens range or lens shift capability of their LCD counterparts. Practically speaking, this means that LCD projectors give users more latitude in where they can place the projector for any given screen size. Usually LCD projectors can be either ceiling mounted or rear-shelf mounted, whereas in many rooms the only way to install a DLP projector would be to ceiling mount it. Second, DLP light engines are relatively light inefficient, so they require hotter lamps to drive the same lumen output. That means more heat, and quite often, more fan noise. In a larger viewing space this is not much of an issue. But in a smaller room, any projector with a 300 watt lamp will produce a more noticeable heat load than a projector with a much lower wattage lamp. For home theater enthusiasts who are investing in dedicated theater rooms, these are not big issues since the rooms can be built to accommodate either type of projector. But most consumers don't have the means to create dedicated theaters in their homes. For them, LCD projectors (so far at any rate) have been offering a compelling set of features that make them easier to install and live with. The Sanyo Z2000 is a tough new competitor that establishes the latest benchmark in 1080p price/performance. It offers excellent image quality, a host of features, and very few flaws, all for an industry-leading rock bottom price. If you have been waiting for prices to drop before stepping up to 1080p, the Z2000 is the product you've been waiting for. As with the other 1080p reviews we are posting, we are delaying the 5-star ratings until we've been able to see and evaluate all of the models coming to market this fall. However, due to the Z2000's exceptional price and performance, it is sure to be one of the highest rated products in the group.